My journey started quite a few years ago when I started going to a weekly workshop at a local arts and craft store, however it wasn't until about 2010 when I started to make art a priority in my life. 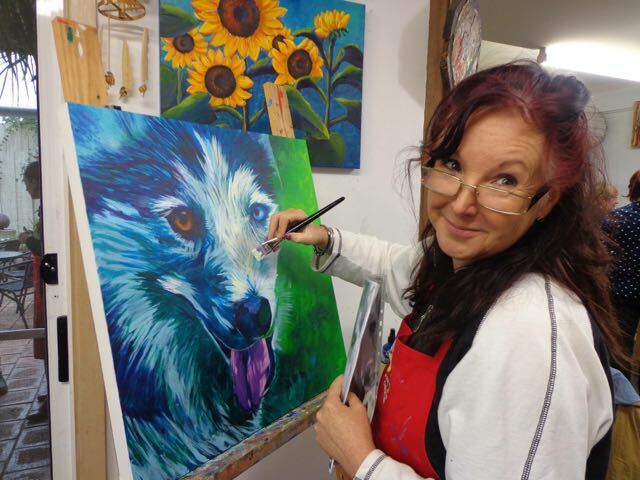 I regularly attend workshops held by renowned local artists and continuously attend general painting classes to hone my skills and broaden my knowledge. 2013 saw me start displaying my work at a local winery restaurant, Ekhidna Wines at McLaren Vale who also graciously commissioned a piece "Ekhidna Staff", and 2016 saw me take on the additional challenge of commencing my Bachelor of Arts in Fine Arts. My work tends to be bright and bold, somewhere in the category of colourist/impressionist, however, i'm still discovering new techniques and styles so who knows where this journey will take me! I hope I can share it with you. "Madi painted a beautiful Paris inspired painting for my daughter Shaye's bedroom as a Christmas present. The colours Madi used in the painting match perfectly with her bedroom linen. Shaye absolutely loves the painting and has just recently asked for another one. Madi is very talented and would definitely recommend you view her wonderful talent." "Hi Madeleine, I hope you had a lovely Christmas and New Year. I just wanted to let you know that the two caricatures you painted were a great hit and very well received on Christmas day. Both my sons and their wives loved them, they thought they were fantastic. So again thank you for your creativity and patience in delivering the final pictures. Kind regards"